Mi Goreng is Indonesian for "fried noodle". 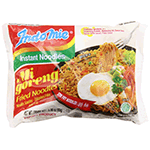 Indomie Mi Goreng is simply abbreviated as Indomie goreng by most Indonesians. Indomie Goreng is a type of instant noodle served without soup and is stirred well with soysauce, oil, and seasoning. This instant noodle derived its inspiration from traditional Indonesian dish called mi goreng, a variant of fried noodle common in Indonesia. Many street vendors sell it and traditional mi goreng is considered as common food by the people. This product has gained a cult following in Indonesia and in various other countries, such as Nigeria, Australia and now Zambia! Product of Thailand.